Where do they come from? Those little pesky bugs that appear out of thin air the moment a bottle of wine is opened. It’s like they have a little wine radar and come flying in from miles around as soon as a cork is popped. 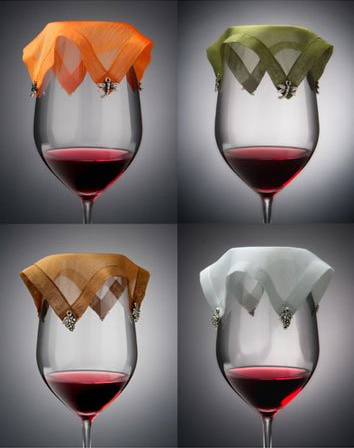 The Wine Veils say no more! The wine accessory simply drapes over a filled wine glass (or an empty one for that matter, if for some reason one was so inclined) and four small silver charms hold it in place. The cover acts as a bug guard, leaving the poor little critters sober and left out in the cold. And the bugs? Well, they can just go back to being invisible — and hopefully stay that way!